Janice Morse, author of the Morse Falls Scale, began the development of the scale with a pilot project in 1985. In 1987, she published the article "Development of a Scale to Identify the Fall-Prone Patient" (Morse, Morse, Tylko, 1989) and in 1997, the book "Preventing Patient Falls" was published. This book suffered a revision in its second edition in 2009. 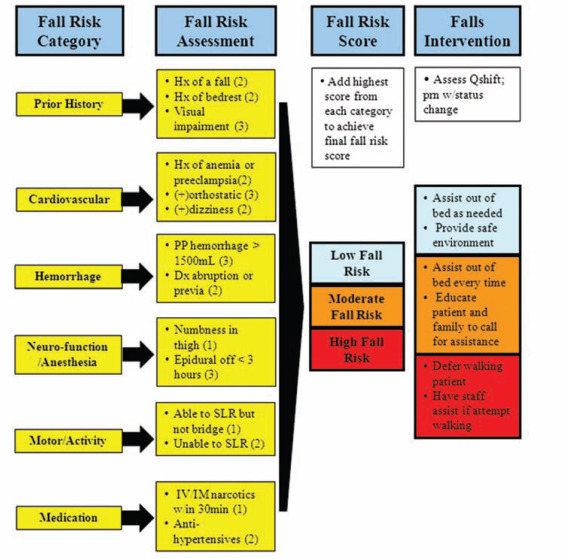 The scale is being applied... A specific scale for assessing the risk of falls was also identified, the Morse Fall Scale (MFS) (13), published in the English language and not yet validated for the Portuguese language, which stood out because of its apparent simplicity of its items of assessment. The Morse Fall Scale (MFS) is an individualized criterion-referenced assessment tool designed for measuring the likelihood of patient falls in hospitals. Despite the scale has demonstrated high validity and reliability in the previous researches, this study is to provide additional validity tests to determine the applicability in the Chinese hospital population. Objectives: To examine the... The Morse Fall Scale scores during three different time periods of hospital stay were used for analysis: the initial assessment score upon admission, the last and the maximum scores recorded from admission to the fall or discharge. The Morse Fall Scale (MFS) is a rapid and simple method of assessing a patient’s likelihood of falling. A large majority of nurses (82.9%) rate the scale as “quick and easy to use,” and 54% estimated that it took less than 3 minutes to rate a patient. The Morse Scale is a fall assessment tool intended for use in acute medical-surgical units, but professionals have not validated its use in the psychiatric inpatient population .